Republicans have worked to obstruct President Obama's agenda at every turn, and this has had devastating consequences for people across America. The GOP's refusal to budge on Garland is but one brick in a wall of legislative obstruction. All these things left undone translate into millions of people whose lives have been negatively affected because of the GOP's intransigence. “It’s simply unconscionable that with Zika infections growing by the day, Republicans insist on playing politics with a public health crisis and will once again support legislation that restricts vital women’s health funding." When even a public health crisis cannot move Republicans to act, we are in dangerous times. Prioritizing partisan gamesmanship over the public good is anathema to good governance. Even when issues have support from a majority of American voters, Republicans won't budge. They long ago abandoned the idea of doing the will of the people, if that would require cooperation with President Obama and Democrats. Especially when that record doesn't exist in a vacuum. Failing for 197 days and counting to approve emergency funding to fight Zika isn't just a line item on an elected official's record. It's now more than 2,700 confirmed cases of Zika in the U.S.—2,700 people with Zika. Failing to even consider The Families of Flint Act, despite the fact that "before Congress went on recess in July, nearly 70 Members of Congress spoke on the floor of the House of Representatives about the need to stay in Washington and pass legislation to help Flint," isn't just another line item. It's leaving an entire city of people without access to clean water from their taps. Failing to raise the federal minimum wage isn't just another line item either. It's leaving 3 million workers, who are working for the current federal minimum wage of $7.25/hour or less, in the untenable situation in which they cannot support themselves doing full time work. 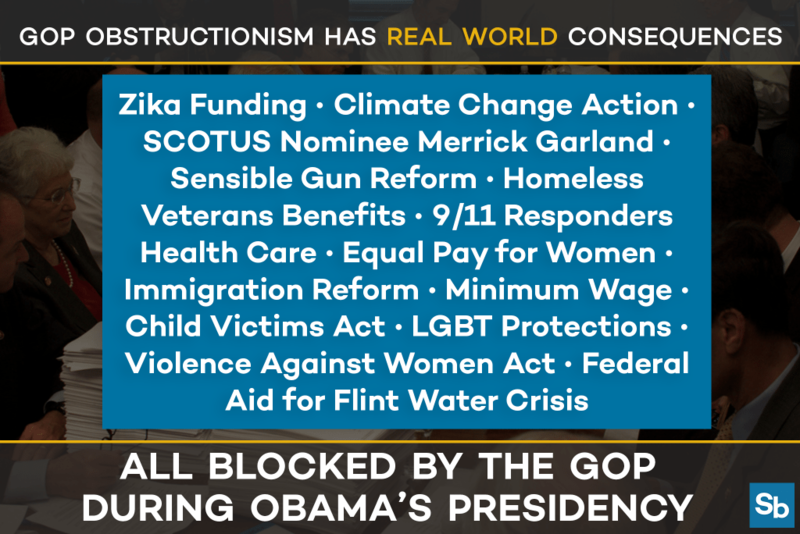 Behind each of these issues are real people who are suffering the very real consequences of the GOP's refusal to act. This is obstructionism for obstructionism's sake, with people getting badly hurt in the process.